It is a great pleasure to join you for the launch of the Cambridge Peking University China Centre. Although I am on home leave and consultations, today's event is the one that I would not want to miss. This is not least because of the invitation from Chairman Zhu Shanlu, an old friend of over twenty years. I also greatly value the meaning and importance of the event itself. 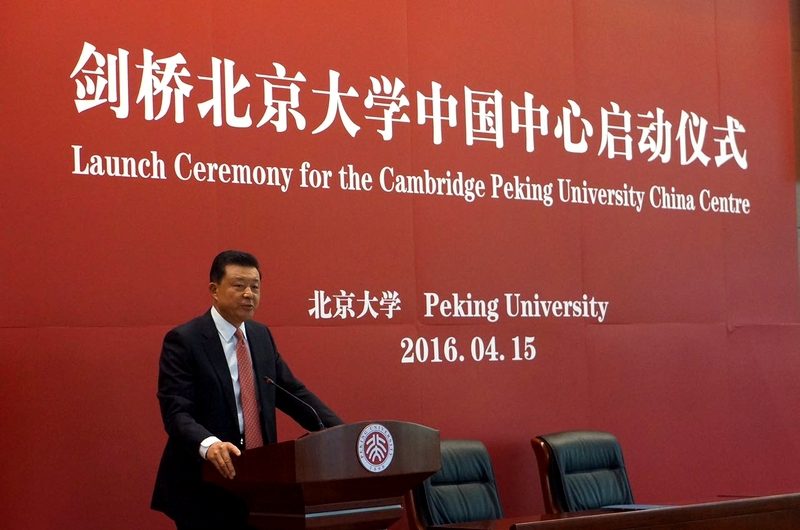 Peking University, or PKU has a long history of association with Cambridge University. The China Centre is the latest outcome of cooperation between Cambridge and the PKU. But it is also a new highlight of educational and cultural exchange between China and the UK. Therefore I would like to extend my warmest congratulations on the launch of the Centre. China study has been advancing fast in recent years. New books on China come out in an endless flow. Fresh ideas and perspectives are made everyday. This goes to show the world's rising interest in China. It is a measure of deepening understanding of China around the world. However, it is undeniable that the study of China has not kept pace with the development of China during the past three decades. Western understanding of China as a result has many limitations. Misinterpretations and misunderstandings still exist. In particular, there are waves of pessimistic predictions on China's development that are divorced from the reality. Imitation won't put one in the lead. Originality does. · How did China emerge as the world's second largest economy in a matter of three decades? · What can this country of 1.3 billion share with other developing nations in terms of development experience and concepts? · How to obtain an objective understanding of the advantages and effectiveness of the Chinese system and contrast that model with the Western ones? · What opportunities will China's development bring to the world? · What impact will China's peaceful rise have on the international relations? The answers to these questions call for joint study and exploration both in China and the rest of the world. PKU and Cambridge, the two world-class universities of the highest academic traditions, have a key role to play in this endeavour. PKU has been regarded as the top Chinese university ever since its founding more than a century ago. Today, PKU boasts flourishing academic achievements and a growing number of fine graduates. Among other things, it is a leading institution in China in the study of Europe and Britain. I have visited PKU more often than any other Chinese university. Back in 2010, I was with Prime Minister David Cameron when he visited PKU. Just a few weeks ago I was here discussing with the PKU Academy of Opera about its cooperation with Britain. And today, I am back once again. Cambridge is one of the most prestigious universities both in the UK and worldwide. The study of China at Cambridge is symbolised by the truly exceptional sinology scholar, Dr. Joseph Needham. His influence has inspired many other distinguished academics both in Cambridge and around the world. I have visited Cambridge more times than any other British universities. In turn, I have met with Sir Leszek more than any other Vice Chancellors of British universities. Just not long ago, we were sitting together for a discussion on the cooperation between Cambridge and PKU. Therefore, the founding of the China Centre, a joint venture of two prestigious universities, is a timely and most valuable initiative. By joining hands in strength, I believe, the China Centre will be a fresh momentum to boost the study of China in both countries and beyond. A university is a place where ideas interact and young minds get tempered. In his visit to PKU, President Xi Jinping encouraged the students here to learn widely and study hard. He advised them to build integrity and uprightness, and to commit themselves to serving the country and the people. · You will have both the Chinese perspective and a global vision. · You will be able to seize the opportunity of China's development and the prevailing trend in the world. · And you will find ways to make innovations and truly contribute to the development of the country. It is also my hope that the Cambridge Peking University China Centre will become a powerhouse, which pulls together the strengths in China studies of both our countries and from the rest of the world. As scholars your unique role, I believe, will help produce more innovative, first-class research and more prominent professionals in this field. I look to your active contribution to promoting academic and cultural exchanges between China and the UK, and deepening mutual learning between China and the West.